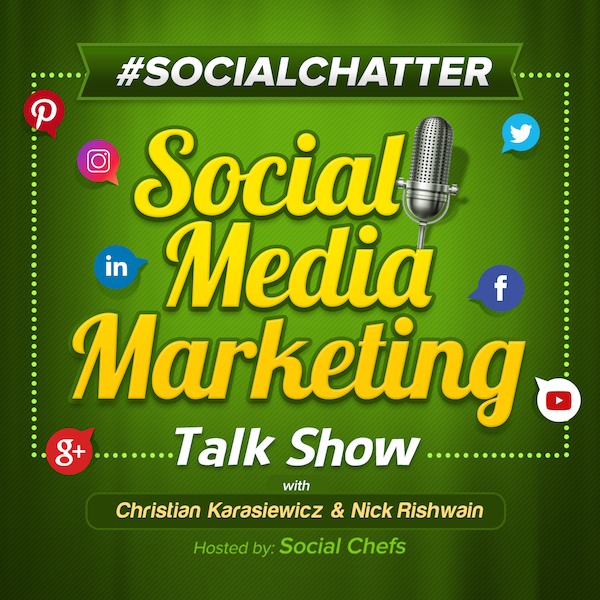 Welcome to this week's episode of Social Chatter, the longest running social media marketing talk show where we cover the latest social media news from this past week, including updates to your Facebook Ad relevancy score, Instagram in-app checkout tags, a new Twitter camera feature, Swish and more. For those of you who missed last week's episode with Vincent Orleck on Pinterest catalogs, you can watch the replay here. Let's see what's new in social media this week with, Christian Karasiewicz. In Facebook news, they are rolling out Facebook Ad relevancy score updates. Your Facebook Ad relevancy score "measures whether the ads that you ran were relevant to the audience that you reached." Instead of providing you with one relevant score, Facebook is now going to provide you with three relevance metrics. This way you better understand what your Facebook Ad relevance score is and how to make it more actionable. These include quality ranking, engagement rate ranking, and conversion rate ranking. Here is more information on each of these Facebook Ad relevance score rankings. Conversion rate ranking: How your ad's expected conversion rate compared with ads with the same optimization goal and competed for the same audience. Your Facebook Ad relevance score is important because this score helps you "understand whether changes to creative assets, audience targeting or the post-click experience might improve performance." Starting April 30, 2019, Facebook will be "introducing relevance diagnostics over the coming weeks and will begin removing the previous relevance score metric." In addition to updates to your Facebook Ad relevance score, Facebook is introducing a posts saved metric. They're removing the offers saved metric and a host of other Facebook Ad metrics. You can read the full list here. Overall, these updates should help you better understand your users and the content they are most interested in. To read the announcement about Facebook Ad relevance score updates click here. Also in Facebook news, they are launching the Facebook Journalism Project Community Network. The Facebook Journalism Project is "an initiative designed to help publishers share information with one another about how to create communities and direct relationships with their audiences." Is your business involved in creating local news? If so, you may want to look into the Journalism Project Community Network. The Community Network can help you learn how to create communities with your audience. You'll learn from others on using local news, subscriptions, memberships and more at this two-day conference from Facebook. In Twitter news, they have launched an updated Twitter camera. The update to your Twitter camera changes how you use Twitter. For example, previously, you would launch the Twitter mobile app and then switch to your camera. Now when you launch the Twitter mobile app, you'll have quick access to your camera. You can take a photo or hold the shutter button to record a video. Afterward, you can tell your followers what is happening. You can now make your tweets much more visual by adding photos and videos. What's unique about this Twitter update is that you can turn on your location and it will automatically pick-up hashtags in your area to include. Currently, a lot of people schedule their Twitter content. By moving to a more visual approach, it encourages you to capture more visual content and then use your tweet to describe what is happening. To get the latest Twitter camera feature, be sure you update your Twitter app from your devices app store. You can read more about this new Twitter camera feature here. Instagram is currently working with 20 big brands to include Anastasia Beverly Hills, Balmain, Burberry, ColourPop, Dior, Huda Beauty, H&M, KKW Beauty, Kylie Cosmetics, MAC Cosmetics, Michael Kors, NARS, Nike, NYX Cosmetics, Oscar de la Renta, Outdoor Voices, Ouai Hair, Prada, Revolve, Uniqlo, Warby Parker and Zara. Instead of directing users to their website, these brands are getting an Instagram in-app checkout process. Whenever their followers want to shop on Instagram, products that you can buy will have checkout tags - this includes posts in your feed, Stories and Explore content. Users can then tap on an item to reveal their product tags and use the Instagram in-app checkout process. Here's a look at the how the new Instagram in-app checkout process with checkout tags works. As you can see, it's convenient to shop on Instagram (finally). While customers won't go through your checkout process, they will have a seamless one when using the Instagram in-app checkout. This may seem like a negative for your business - less traffic to your website means fewer opportunities for customers to learn more about what else your business offers. The good news is that when someone uses the Instagram in-app checkout, they can also track checkout tags from a new "orders" tab. Instagram shoppers can also opt-in to your email newsletter as well during the in-app checkout. Customers can pay using a variety of payment options on Instagram, to include PayPal, Visa, MasterCard, American Express or Discover. We're excited to try out the new Instagram in-app checkout along with checkout tags. How about you? Let us know in the comments if you have questions about this new process for shopping on Instagram. While big brands will have access to this feature, we anticipate all Instagram business profiles will have this feature very soon. In the meantime, you can read more about the new Instagram in-app checkout here. In Snapchat news, they are starting to pay creators for their work on the platform. Recently, Snapchatter, Cyrene Quiamco, was paid $30,000 to promote McDonald's donut sticks. If you've been building up your influence on Snapchat, you might soon get paid. Snapchat has started to pay creators such as Quiamco, one of the platforms top users, to promote products to their followers. Right now, Snap has a lead on augmented reality, compared to other platforms like Instagram. If this is an area you are focused on, Snapchat is a good place to start to grow your influence and have big brands pay you for your work. You can read more about Snapchat paying Snap creators here. The first tool that we have discovered this week is Infogram. Would you like to create infographics for your business? Maybe you want to present your data in charts or create a comprehensive report for a client? With Infogram, you can quickly create beautiful data visualizations. Here's a look at how easy it is to use Infogram. Infogram is available for free. If you need additional projects or the ability to download your infographics or get access to premium templates and images, you can upgrade to Infogram Pro for $19 per month. The second tool that we have for you this week is Swish. Swish is a mobile app for creating social media videos. With Swish, you get access to professional video templates that you can easily edit and share on your social media channels. For example, you can change the text, color, fonts, music, and even the dimensions - quickly! Swish is available as a freemium app. Prices then start at $14.99 per month or you can make a one-time purchase of $199.99.